I,m very sorry for my bad condition. 18 days in the hospital,high blood sugar...more than 400 hi,complicated with MAAG. Now I,m getting better and now rest in the village. 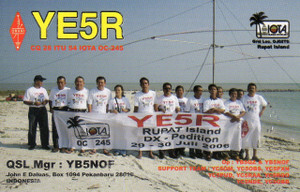 Again sorry also for the YB8XM/P cards OC-271 its too late. Please relay my message in to IOTA friends world wide. Thank's and again very sorry. Adhi,YB3MM visit in to my house 2 weeks ago and he knew my health condition. Tnx Shu san I still wait for a good news from the...next week I will be back to Pekanbaru and start to prepare our equipment there and to send a letter to Palu for arrange with theme in Palu... after then I go to Palu for technical meeting. The schedule worked fine for me today! I was not able to copy your signal, I think I heard part of your call but could not be certain so yes let us try again tomorrow. The band was a little weak on 20m but on 17m I was able to copy JI3DST , JK1TCV, JQ0AZG ,JI1RXO and JA1AGG. On 15m heard was JI3DST,JK1TCV and JA6FIO, so the higher band were performing well. Good luck for tomorrow's try Shu, hope to hear you! Thanks for the fun meet! 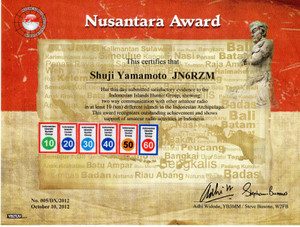 Thanks for ur help Shu San, I can't do it alone...so I hope this pedition wil be success. 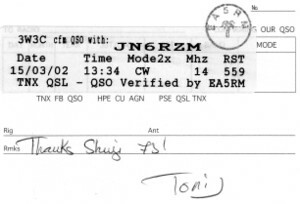 Another informs for our friend TOSHI SAN JH4GJR...his card will send to day He is OK on my log for OC-107 and 108...on my log too many Japan's wkd with me but QSL card as I received no more then 10 %...may be they send via bureau...ok Shu san...I still wait ur information for make the OC DXPEDITION success. As explained by Ucok YB6AR. 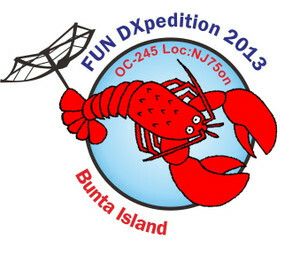 His Bunta Island operation is Fun DX-pedition. It is used for simple testing and checking for preparation of Rondo Island. That's why, they were operating only a few hours. I'm now in FSM Chuuk. No radio tonight, as light lost before antenna work complete. Hope to be fully operational tomorrow, Thursday from around 1000z. 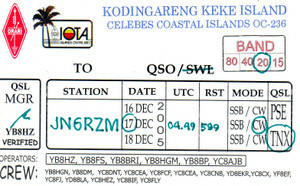 QTH Chuuk Islands IOTA OC-011 Federal State of Micronesia. Please note that the QRZ.com entry is not correct for the IOTA reference, this is from a previous licence holder. 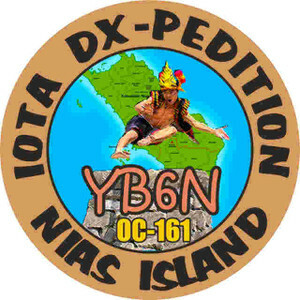 I will be QRV from Nias Island (OC-161) 8-13 March 2013. If any supports for this DXpeditions is wellcome. antenna may be can support us with good antenna. We have only home-brew 3 element beam and 4 element beam. The applicant agrees on behalf of the DXpedition that the guidelines as given in 'Conditions for a Support of a DXpedition' will be accepted. 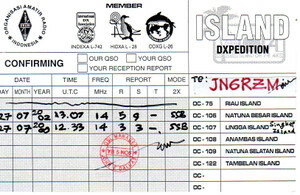 The applicant is obliged to refund the paid-off financial help back to the GDXF if the DXpedition has to be cancelled. The GDXF will only support DX activities if their organizers are willing to reproduce our logo on their QSL cards and in the Internet. In exceptional cases it will be sufficient to mention the grant in another suitable form which must be approved by the GDXF Secretary. 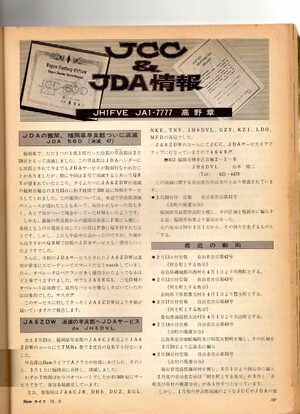 I am Shu JN6RZM Japanese IOTA chaser and supporter for YB5NOF John. 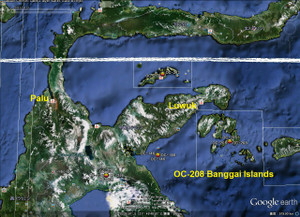 John has plan for OC-208 Banggai Island. 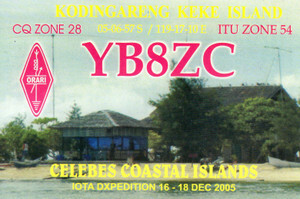 It's very rare IOTA and if he has successful OC-208 IOTA pedition, he will has OC-109 and OC-122 IOTA peditions. I've been supporting IOTA peditions more than 30 in 2005. I was asked to support GDXF for the first time. Thank you for your help please. Sorry for delay in getting back to you about a SKED for AS-077. >If you want AS-077, I may make a Sked with you this weekend. Maybe it is too late now? Possibly on Monday or Tuesday? 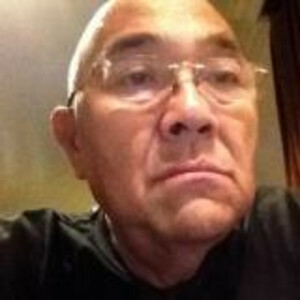 Maybe 15m or 20m? I wanted to go back to C6 - to NA-113 this time to also focus on JA/Asia,but too much other QRL I had previously scheduled. Maybe at the end of 2013 or early 2014. Sounds good. I'll be there at that time. > Thank you very much for your replying. 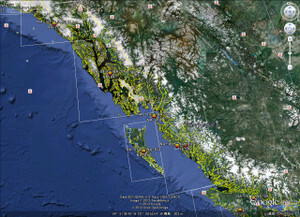 > I had another Sked for NA-036 Vancouver Island VE7DP this morning. > We made many QSOs on 21050 and 18080 between 2300 to 2330UTC. > be waiting for you. Please call them. > How about my Sked? may sit and enjoy the IOTA program following the dinner. separately from the Happy Hour Bar just prior, or at the Marriott Hotel bar. presentations without dinner. Paid attendees will have priority seating. 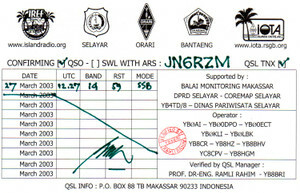 17 meters and later JA7AXN , JH3EUJ , JA4FVE , JA3HU on 15 meters all in the log . and afterno more JA calling , will QSY to 21.050 . 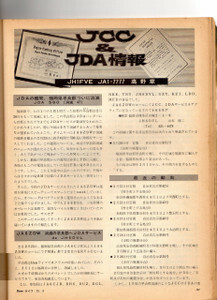 We will try to operate towards JA around 21-24Z as Mr. Gou JA1QXY suggested. I will take part only during NA-218, Moa Grande island. Is Banggai Island OC-208, Sulawesi Tengah, YB8 area? Here is very rare IOTA, I think so. 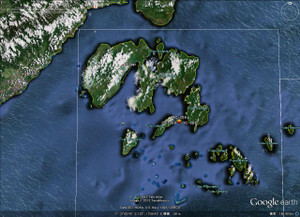 Do you have a plan for OC-208 Banggai Island? I send you my attachment. Wow, very very sorry for no contact with your OC-208 operation. 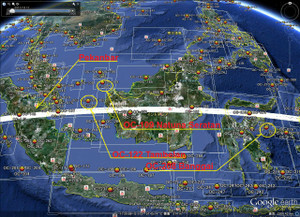 I would like to make a contact with OC-122 OC-157 Banda Island and OC-208 Banggai Island. I and Japanese IOTA friends always donate for our wanted YB-IOTAs. I will be able to gather 500USD minimam from friends. And I can gather from EU/NA, but they will be noisy. Ahahahaha. It will be great job. The first, I inform to JA friends(about 40 members). And the second, I will QSP to EU/NA's gentlemanly friends. The third, I pray and question to DL5ME Mario for German DX Fundertion(GDXF). The forth, you can make application for IREF on website. Probably, you can accept about from 500USD to 1000USD.And do you have your Paypal account or credit card? And you ought to take a new callsign , I think so. 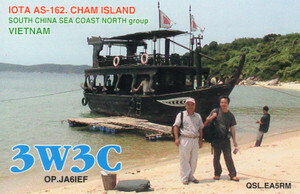 Please send me scanned new qsl card, and then send email to me. I will issue sticker for you as soon as possible. Congratulation. You are soooooooooo great !!!! Those are my all supportings. I gathered about 300USD to 1200USD. Especially, I gathered donations 1200USD on OC-271 Babar Island from 40 Japanese friends and 10 EU/NA friends. (total 4 pcs) are almost ready. 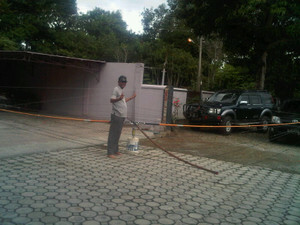 We will try these antenna on 15-17 Feb in Bunta Island. 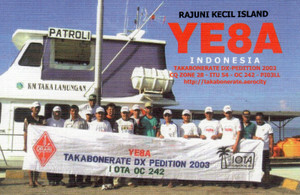 using portable callsign (YB6AR/P etc). 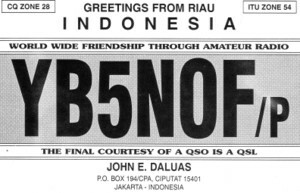 QSL via each home call or listen to their instruction. 40m, 30m, 20m, 15m and 10m and mode of SSB and RTTY. 5 transceiver with each 500watt amplifier. much! Take care my friend, Happy New Year! probably find it in my mailbox tomorrow! Thanks for your help, very much appreciated.